Amitabh Bachchan posted a photo with Ranbir Kapoor on Instagram and updated the fans about his upcoming film Brahmastra. 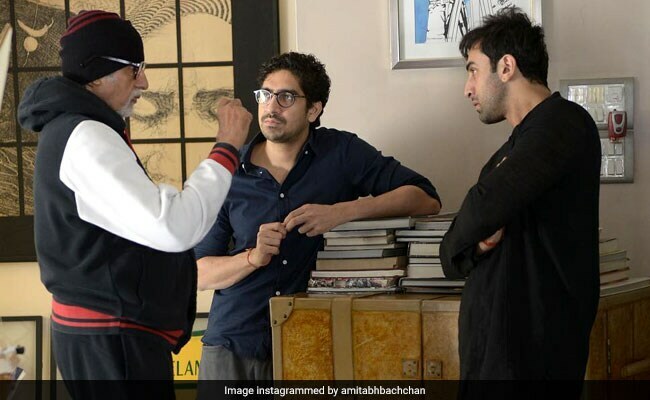 On Sunday, Big B posted a photo, featuring Ranbir and Brahmastra's director Ayan Mukherjee minus film's lead actress Alia Bhatt. "Ranbir Kapoor, Ayan and yours truly at look test for Brahmastra cool .. shoot starts next month .. with Alia too .. a joy to be with this incredible young generation," Amitabh Bachchan captioned the photo. Fans showed their excitement about the film and posted comments such as "can't wait," "the film will be a game changer" and "wow." Take a look at what Big B posted about Brahmastra. Preparations for Brahmastra have begun already and the movie will go on floors, next month. TV actress Mouni Roy will also star in the film. Ranbir Kapoor, Alia Bhatt and the director recently made a trip to Israel for certain preparations of Brahmastra, which is a fantasy adventure trilogy. Alia, who will also co-star with Ranveer Singh in Zoya Akhtar's Gully Boy, wants to be at the top of her game and started going through Brahmastra's scripts some two months ago. Brahmastra marks Karan Johar's fourth collaboration with Ranbir and Ayan's third with the actor. Previously, Ranbir has headlined the cast of Karan-directed Ae Dil Hai Mushkiland Ayan-directed Wake Up Sid and Yeh Jawaani Hai Deewani - all films produced by Dharma Productions. Ranbir Kapoor and Alia Bhatt's Brahmastra will be made as a trilogy, the first part of which is expected to be ready for release in 2019.